Stocking stuffers are not so hard to buy for teenage boys. I like to separate what I buy for my kids into four different categories when it comes to stocking stuffers. Firstly, buy at least one thing that they need (socks, underwear, shower get etc). You can buy novelty versions of things they need to make it more fun. At least you know this item will be used. Next, buy a puzzle or a game, one gag gift, one item of food or drink, something for a hobby or an interest and a practical item such as mug. If you're unsure exactly what to buy, check out 75 stocking stuffer ideas for teen boys. Find them in 12 different categories below. There are lot of ideas and links to specific suggestions too. Fit both for men from size US Size 4 to US Size 12. "Where we Droppin' Boys" is a slogan said when playing fortnite so it's a great gift for a fortnite fan. Fold or roll the t-shirt up to fit in a stocking. The t-shirt comes in different sizes. It is pre-shrunk 100% cotton and features a double-needle stitched neckline. It has a seamless three-quarter inch collar. This is a great stocking filler for a sporty type. ​It's perfect for improving hand and eye c0-ordination and reaction time. It's great for improving for all kinds of sports such as baseball. The reaction ball has a six sided high bounce rubber design so it's a bit unpredictable as to where it will go. ​You can use it solo against a hard surface such as a wall. Or play with it between two people. A space pen is such a cool gift. He can use the pen to write on any surface, at any angle or even underwater. It writes in extreme temperatures from -30F to 250F. When closed, the space pen is the perfect size to carry in your wallet, pocket or a bag. Open it up to a full sized pen which is perfect and comfortable to write with. A fab sized stocking gift and really useful too. I think it's hard to go wrong for most teen boys for a remote control fart machine. Just hide the sound box, then press the remote control at the appropriate time to set it off. There are 15 different fart sounds. Lots of juvenile fun and hilarity to be had. Check out some more gag gift ideas for teen boys. Funny book (see the Pranklopedia book for an idea). Another cool idea for a prankster is the pranklopedia book. There's lots of really great ideas for pranks in this book that are fairly easy to pull off. Just bear in mind, that you may be the victim of some of the pranks. A fab stocking stuffer to keep teens occupied over the Christmas break. If he plays lots of sports or is quite active, it's hard to go wrong with some clothing accessories such as some sports socks. The nike socks featured are a 6 pack of cotton cushioned low cut socks. They come in different sizes and are super comfortable to wear too. Other sports clothing could also make good stocking fillers. Ideas include shorts and vests. ​This beanie is thick, soft, and large enough to wear over the ears. One size will fit most. ​Will you get licorice or skunk spray? ​Strawberry jam or centipede flavor? Stinky socks and lawn clippings. It may be worth filming some reactions as people eat the beans. Connect this small and portable speaker via bluetooth to your smartphone, tablet or any other device with bluetooth. It has a 30 foot range. You can then wirelessly stream your music and listen to it wherever you want. The speaker is so small and portable. It's easy to throw in a bag and take to a friend's house or just move around the home. The sound is great for such as small speaker. The speaker is IPX7 Certified waterproof so feel free to take it with you in the pool, the ocean or shower. A perfect stocking filler for any teenage music lover. If he likes working out and listening to music, he will love some wireless headphones. They connect to a smart phone via bluetooth so he can stream his music and playlists straight from his phone to the earphones. And there are no wires to get in the way when running, hiking, walking or whenever he's listening to music on the go. It plays for up to 8 hours of talk time after only 2 hours of charging time. The earphones are certified waterproof so are a great choice for exercise, running, hiking and the gym. You don't have to worry about sweating or getting wet. How often is he out and about and his phone runs out of battery? This portable charger is small and compact so can easily fit in a bag, pocket or stocking! It's super useful and will provide him with an extra charge for his phone when he's forgotten to charge it at home. 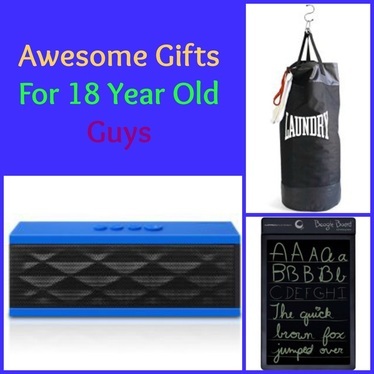 They make fantastic gifts for teen boys when you don't know what else to get. He could also keep a tile mate in his school bag or attach to anything else he regulary loses. This is a cork phone case for iphones. It provides protection against knocks and scratches. It has an eco friendly cork wood exterior: 100% Natural, Sustainable and Renewable. Cork trees do not have to be cut down in order to harvest the wood. Cork is naturally shock absorbing and water resistant. It looks good and there are different designs too. This swiss army pocket knife is a great little gadget with lots of practical uses. It might be particuarly good for a teen away at college or a young teen who is practical or an outdoor type. It's a great tool to have in you go camping. . It features 10 useful tools including a small and large blade, two screwdrivers, bottle and can openers, a corkscrew and a lot more.